lawsuit | Scuffalong: Genealogy. lawsuit – Scuffalong: Genealogy. He was rejoicing at the opportunity. The sixth in an occasional series excerpting testimony from the transcript of the trial in J.F. Coley v. Tom Artis, Wayne County Superior Court, November 1908. I have had a conversation about this land. All I know is what Hagans and Tom told me. The first talk was with Napoleon Hagans. (Defendant objects.) Best I remember I went to him to borrow some money to open my brick yard in the Spring. He referred to this deal and some other deal. Tom wanted to take up some papers, and had done so, and I remarked to Hagans how much better off than he was before. He said he was rejoicing at the opportunity. He promised to give 800 lb. of cotton until he could work a advance to him. He said if Tom did that he would never disturb him his life time. I asked Hagans to have it in a written contract, that his heirs might dissent from it. He replied that 800 lb. was a good interest on his money, and his heirs would probably be satisfied. I had a conversation with Tom. I saw him two or three weeks after that. (Plaintiff objects.) I spoke to him about Hagans taking up the Exum paper. He told me Hagans had ***** to take that up. Hagans had given him a chance to pay the debt off. Whenever he paid anything on the principle, he would not have to pay the 800 lb., but simply a lawful interest on the money. I advised Tom to do his best and pay some in on his principal. He said that he had taken up the mortgage; had it transferred. He said Claim, I might have said mortgage. I don’t say ‘Pole Hagans told me all his business, but I knew about as much as anybody. Said he was going to let him, (Tom) pay 800 lb. of cotton until he could pay the principle. Mortgage given in 1881 to Mrs. Exum. This conversation about 12 or maybe 14 years ago. Don’t know whether it was as late as 1890. Began brick business in 1893. I can’t tell whether it was in 1880 or ’90. ‘Pole Hagans died about two or three years before this took place. Tom married my sister. He is not a member of my church. I turned him out. He is a Primitive Baptist. I preached Napoleon Hagans’ funeral. Elder Jonah Williams was a brother of my great-great-great-grandfather, Adam T. Artis. Adam Artis married Napoleon Hagans‘ half-sister Frances Seaberry. Tom Artis married Jonah and Adam’s sister Loumiza Artis. At the heart of Wayne County Superior Court proceedings stemming from the suit in J.F. Coley v. Tom Artis (1908) was a dispute over 30 acres of land. Thomas “Tom Pig” Artis began renting the property in 1881 from W.J. Exum. In 1892, Exum’s widow Mary sold it to Napoleon “Pole” Hagans. In 1896, after Napoleon’s death, the land passed to his sons Henry and William S. Hagans, and in 1899 Henry sold his interest to his brother. In 1908, William S. Hagans sold the 30 acres to J.F. Coley. 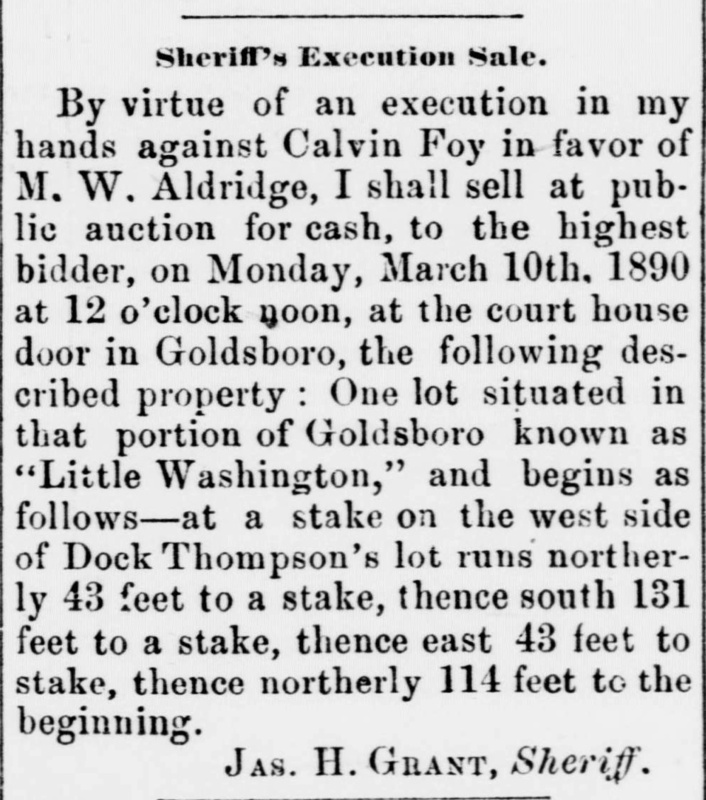 Coley filed suit when Tom Artis laid claim to it, arguing that Napoleon had sold it to him. Tom claimed that the 800 lbs. of cotton he tendered to Napoleon Hagans (and later, his son William) was interest on a mortgage, but William Hagans and other witnesses maintained that the payment was rent. The trial transcript is replete with testimony revealing the personal relationships among witnesses. Tom Artis testified that he rented the “Adam Artis place.” William Hagans testified that his father was in feeble health in 1896 when he called him and Henry together “under the cart shelter” to tell them he would not live long and did not know to whom the land would fall. William testified that Pole asked them to let “Pig” stay on as long as he paid rent, and they promised to do so. Tom Franks testified that “Pole was a first-rate business man.” Jonah Williams, Adam Artis’ brother, testified that he borrowed money from Napoleon to open a brickyard in the spring of 1893 and had preached his funeral. He also noted that “Tom married my sister [Loumiza Williams Artis, who was deceased by time of this trial]. He is not a member of my church. I turned him out. He is a Primitive Baptist. I preached Napoleon Hagans’ funeral.” Jesse Artis, another of Adam Artis’ brothers, testified that he had worked on Hagans’ property as a carpenter for 18 years and noted, “I don’t know that Tom and I are any kin, just by marriage.” John Rountree testified that he was a tenant renting from Hagans on thirds. Simon Exum, Delilah Artis‘ husband, testified: “I am no kin to Tom [Artis] as far as I know, except by Adam. His first wife was my wife’s sister.” H.S. Reid testified that he was Tom Artis’ son-in-law. The court found for Coley and against Artis. Thomas Artis was a son of a free woman of color, Celia Artis, and her enslaved husband, Simon Pig. Though, ultimately, nearly all free colored Artises are descended from a common ancestor in southside Virginia, by the late 1800s knowledge of these remote links had faded. There were dozens of Artis families in Wayne County during the antebellum period, and the relationships between them are unknown. Celia Artis was a close neighbor of Adam Artis, but the families apparently did not regards themselves as kin. Still, they were inextricably intertwined. The Artises, Haganses and Reids had been neighbors in the Eureka area for generations. Celia Artis and Henry S. Reid’s grandmother Rhoda Reid were the wealthiest free women of color in the county. Adam Artis married Napoleon Hagans’ half-sister Frances Seaberry. Adam’s sister Loumiza married Tom Artis, as noted above. Henry S. Reid, son of Washington and Penninah Reid, married Tom Artis’ daughter. Henry’s first cousin Henry Reid, son of John and Mozana Hall Reid, married Adam Artis’ daughter Georgianna Artis. Adam Artis’ son William Marshall Artis and grandson Leslie Artis married Tom Artis’ nieces, Etta and Minnie Diggs. And on and on. Aunt Bert shot a white man. Suit for $25,000 personal damages has been filed by James L. Warren against Odessa Waddell Williams, executrix of the estate of the late Bertha Mae Murdock, in Iredell Superior Court. Warren contends in his company that he suffered the damages when Bertha Mae Murdock allegedly shot him in a restaurant near here March 28, 1944, prior to her death. According to Warren’s complaint, she allegedly shot him while he was visiting at Bill Bailey’s Barbecue Stand four miles west of here. He claims she was a co-partner in that firm at the time. Warren says that, as result of the alleged shooting, his leg had to be amputated. Statesville Record & Landmark, 16 December 1955. I’ve been looking for an article like this for years, and I don’t know how I missed this one. Still, I’m hoping to find something from 1944, the year Bertha Mae Hart Murdock, daughter of Harriet Nicholson Hart, shot James Warren. Here’s the version of events my family tells: Aunt Bert married a scandalous man who ran a roadhouse out in the country catering to white folks looking for a little liquor with their barbecue. A patron said something to her one day, and maybe got fresh, and she pulled a pistol and shot him. (There was no “allegedly” about it.) She was convicted and sent to the state women’s prison in Raleigh, where she served as cook for the governor before her release. 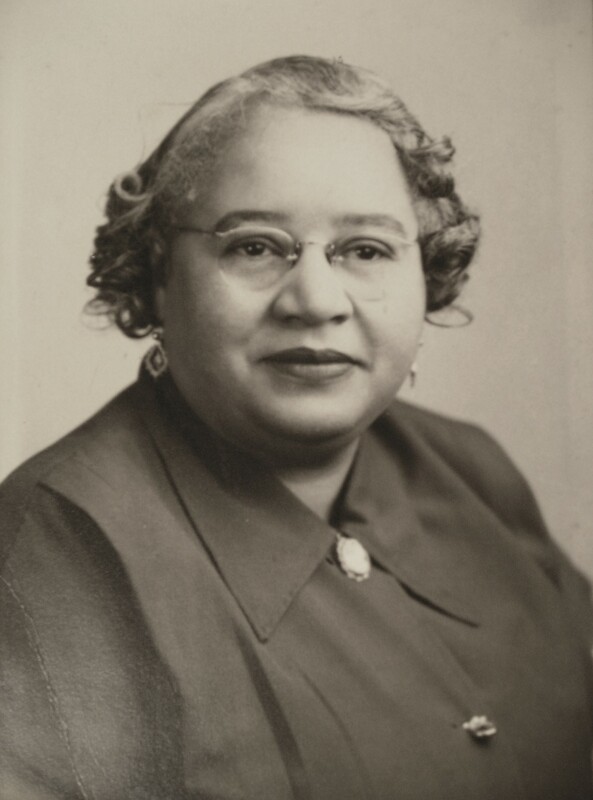 Photo of Bertha M. Murdock in collection of Lisa Y. Henderson.